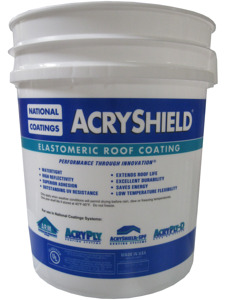 AcryShield A510 is an excellent choice as a top coat over asphalt, single-ply, SPF, metal and concrete roofing. A510 can also be applied as a base coat for both SPF and metal roofing. A510 provides longevity and brightness with superior dirt pick-up resistance and protection against biological attach such as algae and mold. The AcryShield A510 is ideal for areas where extra levels of low temperature flexibility is required (areas where temperatures drop below 0˚F). A510 exceeds all ASTM D6083 requirements and also offers excellent tensile strength, elongation, and wet adhesion.